President Obama’s new policy on Cuba opens the door to establish ties with the country for the first time in a half century. But this change comes as the Cuban American population itself is changing—in its demographics, views of U.S.-Cuba policy, and its politics. The nation’s Cuban American population numbers 2 million, up from 1.2 million in 2000. Much of that growth has come from Cuban Americans born in the U.S., leading to a decline in the share born in Cuba from 68% in 2000 down to 57% in 2013. 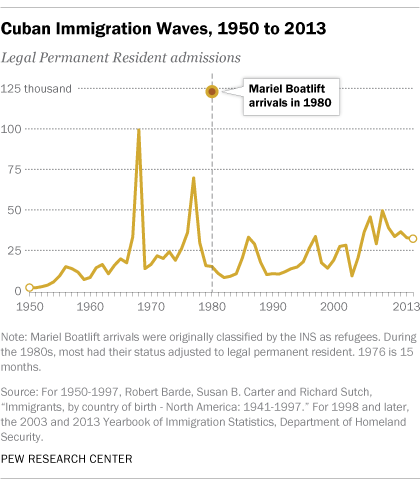 At the same time, a new, more recent wave of Cuban immigrants has arrived in the U.S. Since 1990, more than 500,000 Cuban immigrants have entered the U.S., according to the U.S. Department of Homeland Security. That has altered the demographics of those born in Cuba as the older generation of Cuban exiles passes away. In 2013, more than half (56%) of Cuban immigrants had arrived since 1990, according to a Pew Research Center analysis of Census Bureau data. At the same time, political party affiliation also varies among Cuban immigrants. Some 57% of recent Cuban immigrant arrivals (those arriving since 1990) say they identify with or lean towards the Democratic Party and 19% say the same about the Republican Party. However, among Cuban immigrants who arrived before 1990, 48% say they are Republican while 35% say they are Democrats, according to the new analysis of the Pew Research Center’s 2013 survey of Hispanics. In addition, political party affiliation among Cubans registered voters has changed. Democrats have made inroads with the community, with younger Cubans leaning increasingly Democratic compared with their elders. Shifting political party affiliation may have—or already have had—implications for the Latino vote in Florida. The state is home to two-thirds (68%) of the nation’s Cuban population, but also growing populations of Puerto Ricans and other Latino groups. For example, in 2012, 49% of Florida Cuban voters supported Barack Obama and 47% supported Republican Mitt Romney, according to the Florida exit poll. And while more Latino registered voters are Republicans than Democrats in Miami-Dade County—home to 46% of the nation’s Cuban American population—the opposite has been true statewide since 2008. Older Cuban immigrants also differ from more recent Cuban immigrants in their levels of voter participation, with more recently arrived Cuban immigrants less likely to vote than those who arrived before 1990. In 2012 among eligible voters, 56% of recent Cuban immigrant arrivals voted compared with 75% of those who arrived before 1990, according to a Pew Research analysis of Census Bureau data. On views of U.S. relations with Cuba, a growing share of Cuban Americans in South Florida has said they oppose the U.S. embargo of Cuba. For example, a Florida International University survey of Cuban American adults in Miami-Dade county conducted earlier this year found that 52% opposed continuing the embargo, up from just 13% who said the same in 1991. (The poll also found that 48% favor keeping the embargo.) Opposition to the embargo was highest, at 58%, among Cuban immigrants who arrived in 1995 or later. As a result, Cuban American views of the U.S. embargo now mirror those of all Americans—more than a decade of polls by Gallup, through 2009, have found that about half of Americans have backed ending the embargo. A new Washington Post poll conducted after Obama’s announcement found 68% of Americans favored restoring trade with Cuba, up 11 points since 2009. The FIU poll also found that 68% of Cubans in Miami favored re-establishing diplomatic relations with Cuba, with 80% of recent Cuban immigrant arrivals saying this. By comparison, 47% of Cuban immigrants who arrived before 1965 said the same. Among all Americans, 64% say they favor establishing diplomatic relations with Cuba, according to the Washington Post survey. A new poll of Cuban Americans nationwide conducted by Bendixen & Amandi International for the Miami Herald, El Nuevo Herald and the Tampa Bay Times finds similar patterns by age and by immigration wave. It also finds that Cuban Americans are divided over the president’s announcement about Cuba, with 48% disagreeing with the decision to begin normalizing relations with Cuba and 44% agreeing with it.